x6894xh101101 - Acrylic pro style cap w GET YOUR KICKS ROUTE 66. Black acrylic pro style cap. Shown is GET YOUR KICKS ROUTE 66 but any patch can be sewn on. One size fits most Velcro belt. x123601x1303601 - CALIFORNIA US 66 Flame fire cap. Black brushed cotton cap with Red side flame embroidery. One Size Fits Most Velcro Adjust. Shown with patch # 1236-01 but any patch can be sewn on. x15101x6892 - CRUISIN' ON ROUTE 66 black visor - Black visor with Velcro adjust and 6892 (© Route 66 USA). Other patches available. #2566/1123601 - Black fire flame cap with red embroidered flames with #2566 sewn on ( or most other logos). One size fits most velcro adjust. Brushed Cotton. x6894x1305801 - GET YOUR KICKS ON ROUTE 66 Flame fire cap. Black brushed cotton cap with Silver-Grey flame embroidery. One Size Fits Most Velcro Adjust. Shown with patch # 6894 but any patch can be sewn on. 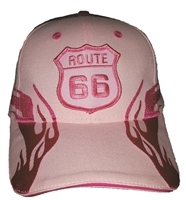 x687656x1305556 - Pink side flame Route 66 brushed cotton cap. Hook and Loop belt. One Size Fits Most adjust. Temp11 - RETIRED CRUISIN ROUTE 66 black bucket with Route 66 6895 (or any patch) - Roll up fishing hat or bucket, sized Sm, Med, Lg, or XL. Shown with RETIRED Cruising on Route 66 but any logo can be added. #6895/17499 - Low Profile denim cotton cap with hook & loop adjust (one size fits most) with RETIRED 6895 (any logo can be used). #6893/1125801 - ROUTE 66 "states" on black cap with grey flames. Shown with # 6893 (©) but any patch can sewn on. One Size Fits Most Hook & Loop Adjust. x6877x17401 - Low profile Black (other colors available) cotton cap with ROUTE 66 US 66 (other logos available) sewn on. One Size Fits Most Velcro Belt Adjust. #9596/1301101 - Royal Blue side flame cap with ANY ROUTE 66 logo (but the ROUTE 66 fire shield is shown). One Size Fits Most Hook & Loop belt adjustment. 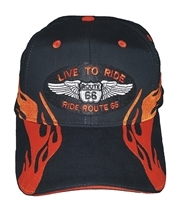 x687639x11501 - ROUTE 66 Flame fire cap - Black raging flame fire cap with graduated Red-Orange-Gold embroidered flames. Shown with # 6876-39 but any patch can sewn on. One Size Fits Most Velcro Adjust. x1125556x687656 - Pink cap with pink embroidered flames. Shown with # 6876-56 but any patch can sewn on. One Size Fits Most Hook and Loop belt adjust. hHW23379 - ROUTE 66 THE MOTHER ROAD shadow cap. 1 size fits most hook & loop adjustable belt. 3D embroidery. 1 dozen Pre-Pack color assortment includes 3 Black, 2 White, 2 Navy Blue, 2 Royal Blue, 1 Grey, & 2 Beige. #6877/18201 - ROUTE US 66 knit beanie. ROUTE US 66 # 6877 sewn onto black knit w cuff 0182-01. Other ROUTE 66 designs available. Other color knits available. Washable. x6892xw01 - 100% cotton black (other colors available) headwrap w ROUTE 66 6892. © Route 66 USA. x6888xw01 - 100% cotton black (other colors available) headwrap (doo rag) w ROUTE 66 6888.